All transactions are safe and secure with a reliable history in online purchasing behind each of our associates. Buy the I hate Spencer t-shirt to own Hills clothing and merchandise. Let everyone know that you're a good bff with this tee that is available in both short and long sleeves. 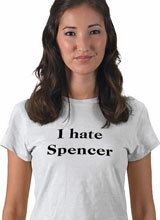 The design reads, "I hate Spencer". It is referring to Heidi Montag's significant other Spencer Pratt. Heidi enters into combustible relationships and ignores her friends, a pattern that is confirmed by Heidi's father during Spencer Pratt's visit to her family's home. Specifically, Heidi cuts ties with Lauren Conrad (LC) to move in with Spencer, a decision that can only end in doom. In addition to the I hate Spencer tee above, browse the Hills Clothing Gallery for more apparel like men's and women's clothes, kids shirts or hoodies.